Far off/ a gazelle slices the wind in half/ beating its speed/ breath upon breath/ this is the total picture of freedom’s worth/ that a sleeping horse is dreaming of. The true dream/ recurs as a bath in the nearby river, occasionally coming up for air/ and what it is, to look upwards from underneath the glazed sheet of water/ into a world, where the sun isn’t/ but a blot of luminous blue gathering in your eyes/ water coiling up, you, and your silver hair. Swim up with thrust/ your anatomy recast /into human, alas, as you near the brink/ and then yourself. Reach up, and out, your fingers grip /the alluvium. You will wake up. Freer than usual. desires of the ugly and gaunt. to fill up all such days. Image by Lee R. Berger. Medha Singh functions as India Editor for The Charles River Journal, Boston. She is also part of the editorial collective at Freigeist Verlag, Berlin. Her first book of poems, Ecdysis was published by Poetrywala, Mumbai in 2017. She took her M.A. 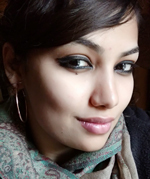 in English literature from Jawaharlal Nehru University, New Delhi and studied at SciencesPo, Paris through an exchange program, as part of her interdisciplinary master’s degree. She has written variously on poetry, feminism and rock music. Her poems have appeared widely, in national and international journals. Her second book is forthcoming. She lives inside the eternal eye of the New Delhi summer.